An army of large vans. A couple of dozen people standing around. Welcome to a Los Angeles movie shoot; just another day experiencing Los Angeles. 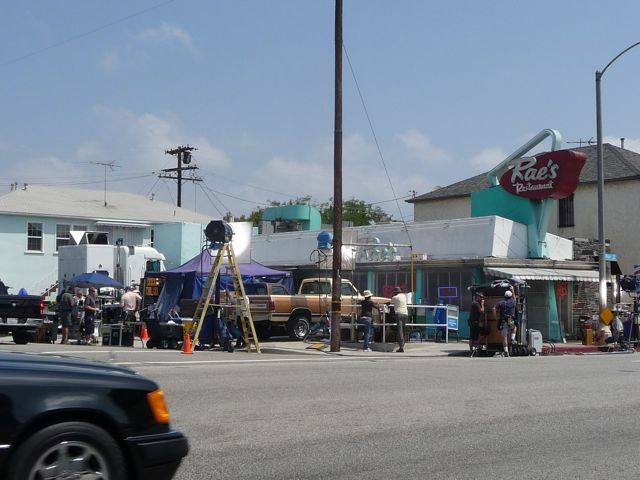 Back in 2010, our last summer living in Los Angeles, I was driving up Santa Monica Blvd in Santa Monica - and came across a movie shoot at Rae's in Santa Monica. If I had time, I would have stopped. In this case, I was on my way to an appointment: only had time to slow down a bit and click off a few photos. 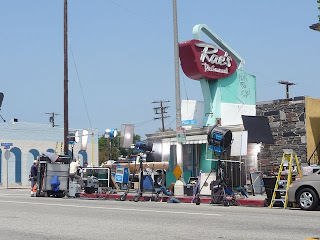 Rae's is a classic "time machine" '50's style diner. I've eaten there before. The food is good, the atmosphere is great. 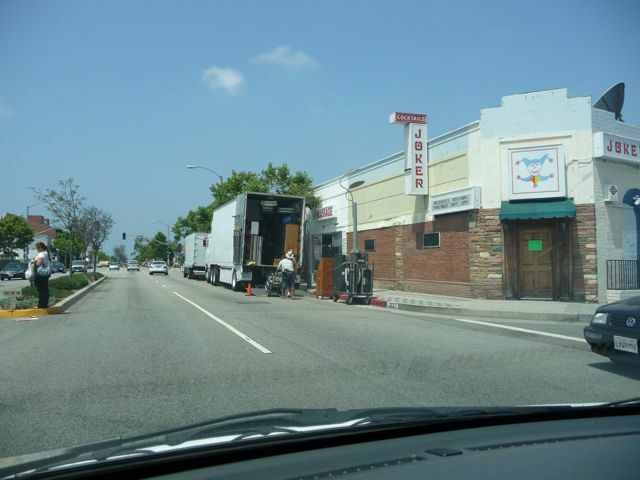 Here's another view on a walk up Santa Monica Blvd that same summer. 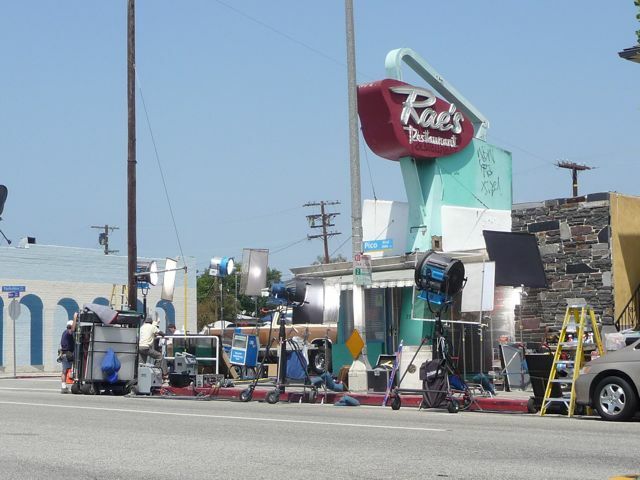 Rae's has been in countless movies, TV shows, commercials and videos. One of the results of living, or in my case, having lived, in Los Angeles is seeing familar places on the big or small screen. Here's some links to previous posts on this blog when I across the filming for It's Complicated, Drillbit Taylor and Dinner for Smucks. No, I haven't seen any of these films, so I really can't comment on them. 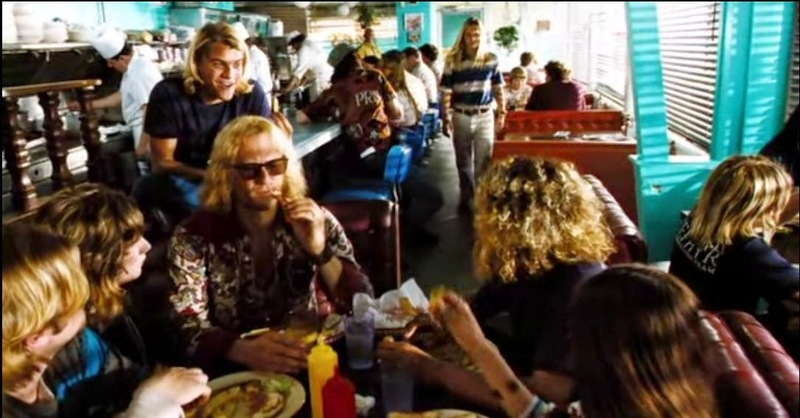 In the case of Rae's, I immediately recognized the interior while watching the 2005 film Lords of Dogtown, a biographical drama film focusing on the 1970's Santa Monica/Venice Zephyr skateboarding crew. 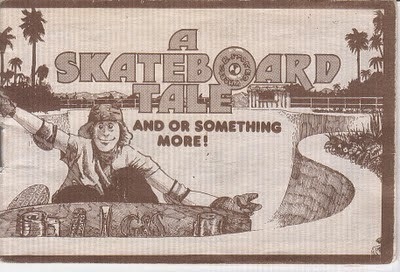 As an aside, during that same era (and just a few miles away), someone passed along Gordon & Smith's Skateboard Tale and/or Something More. Loved the style, vibe and (eventually) the message of this little comic book style religious tract. One of those many things God used as a stepping stone in my own conversion experience. Here's a link to a previous blog post if you want to read the whole thing. 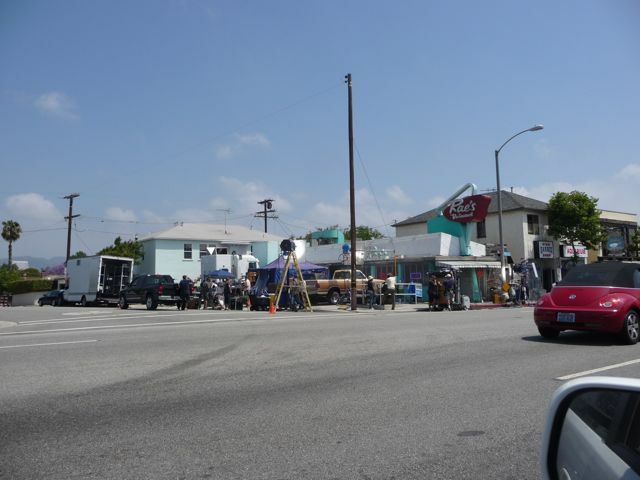 Diners of the 1950's, skateboarding in the 1970's, movie shoots in the 21st Century ... and driving on. Just another sunny day experiencing Los Angeles.